Learn how to play 3 Card Poker. The game of 3 Card Poker uses a Standard English deck of 52 cards and is played on a blackjack-style, half-moon shape table with a layout made specifically for the game. Regular casino chips are used to signify bets. To receive cards each player must place a wager in the Ante and/or the Pair Plus wager circles. Once the wagers are placed, the dealer will deal three cards face down to each player and to themselves. No additional cards are drawn. Think of the game as 3-card stud with nice bonus payoffs for big hands! 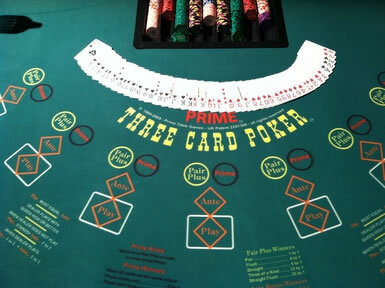 Once the player is seated at the table and has gaming chips, they will see that there are three circles for wagers in front of them. Unlike baccarat or blackjack, where only one bet is necessary, 3 Card Poker players routinely place wagers on all three circles. New players should keep in mind that they will often be wagering at least three times the table minimum. If the low bet is $5, expect each hand to cost $15 to complete. Most players start their play with the Ante wager, which is a bet against the house. The player is wagering that their three-card hand will be higher than that of the dealer. If the player’s hand is indeed higher than the dealers, the Ante wager pays even money. However, there is an additional wager that must be made if the player wants to actually have a chance to win. After the player looks at their three-card hand they must either fold or raise their bet. 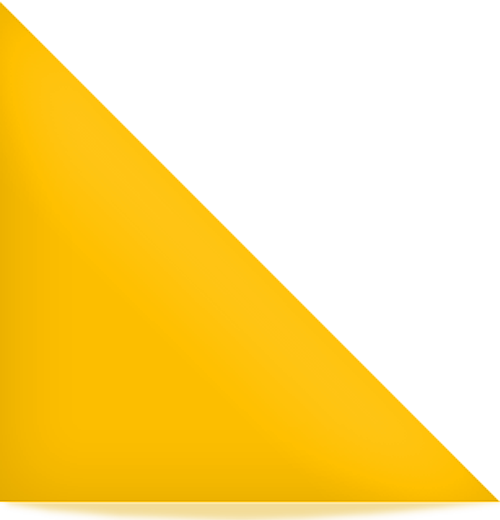 The Raise (sometimes marked Play) circle is next to the Ante circle. To continue playing after looking at their hand, the player must match their first bet with a second bet that goes in the Raise circle. Once each player makes their decision the dealer will take the folded cards, take the forfeited wagers, and then expose their own three-card hand. The Pair Plus wager is a separate bet that wins anytime the player receives a hand of at least a pair. Higher-ranking hands have higher payoffs than the even-money offered for a single pair. The Pair Plus wager may be made without an Ante bet and it is paid regardless of what the dealer&‘s hand is. However, the dealer must have at least a Queen-high hand to qualify. If they do not they will pay only the Pair Plus wager winners and any Ante bets, not any Raise wagers. If they do have a Queen-high or better hand they will pay both the Ante and the Raise wagers, and of course any Pair Plus winning wagers. In 3 Card Poker a straight beats a flush. All suits have the same value, and the rank of cards is: Ace (highest), King, Queen, Jack, Ten, 9, 8, 7, 6, 5, 4, 3, and 2. The highest hand is Ace, King and Queen of the same suit, sometimes called a Mini Royal. The lowest hand would be 2, 3, and 5. If the player and dealer have the same hand, it results in a push and no chips are won or lost. 3 Card Poker wouldn’t be nearly as much fun as it is if there weren’t some bonus payoffs for high hands. While the casino odds differ by casino and online gaming site, every property has an Ante bonus and a long list of payoffs for the Pair Plus bet. Regardless of whether the dealer qualifies or not, and whether the player’s hand wins or loses, the Ante Bonus and Pair Plus winners are always paid. 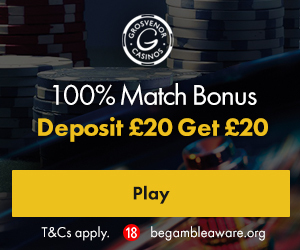 Casinos have predominantly adopted an Ante Bonus structure that pays a bonus for just three hands, a player straight (1 to 1 on the Ante bet), a player three-of-a-kind (4 to 1 on the Ante Bet), and a player straight flush (5 to 1 on the Ante bet). The odds vary, but with this structure the casino edge on the Ante bet is 3.37 per cent. At some land and internet casinos, the game of 3 Card Poker is offered with a Mini Royal Bonus. Again, the bonus varies and so do the casino odds. Several properties offer 50 to 1 on the Pair Plus payoff for a player Mini Royal. Finding the most in-depth information about odds, pay tables, and progressive jackpots will help you discover the best payoffs for your 3 Card Poker play.